If you live within a couple of hours of IMS and you are not here, you are missing a very good day at the track. No, it’s not brilliant sunshine. In fact, I have not seen the sun all day. But the temperature is a perfect 72-degrees with a slight breeze. Humidity is low and it is very pleasant. Because of the gray skies, the crowds have stayed away. 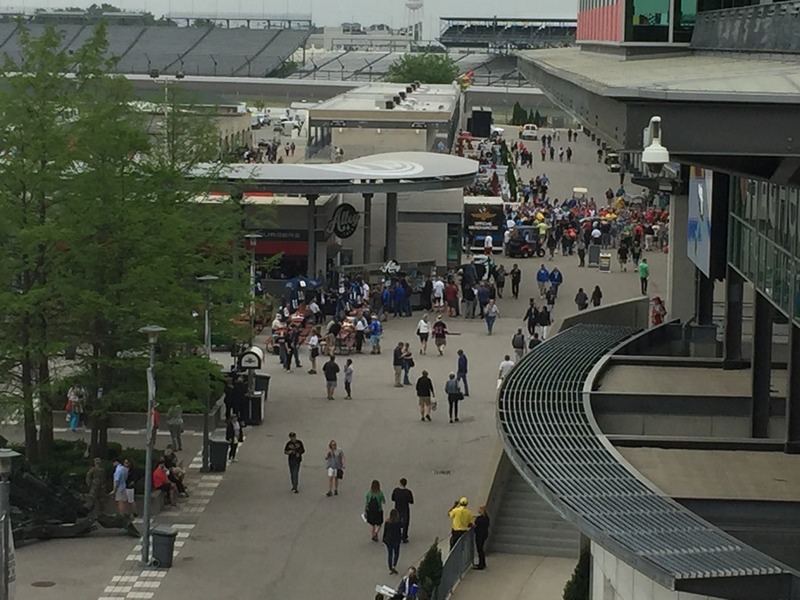 Although crowds are good for the IMS bottom-line, the lack of them is good for the fans that are here. Of course, the big news of the afternoon is the first significant impact of the month. James Davison lost control in Turn Two and had a heavy impact with the outside wall. He almost missed the SAFER Barrier. Except for a sore knee, Davison was fine, but he did some significant damage to the car. I took this photo in the pits less than five minutes before he crashed. I was going to point out how you cannot see the black lettering on the red car. It looks sharp, but the sponsors are doing themselves no favors by putting dark letters on a dark background. Maybe since the car needs to be rebuilt now anyway, perhaps they will make the lettering easier t read. Davison said they trimmed the car out in a search for more speed. They have been one of those cars lurking dangerously close to the bottom. With Bump Day tomorrow, that is not where anyone wants to be. I’ve been finding myself paying more attention to the back-end of the field, than the front. Those that are currently at or near the bottom are Jack Harvey as the thirty-fifth fastest today, then JR Hildebrand, James Davison, Graham Rahal, Max Chilton and thirtieth quick is Pippa Mann. I’m not too worried about Graham Rahal, but the rest of those drivers need to pick up their game. 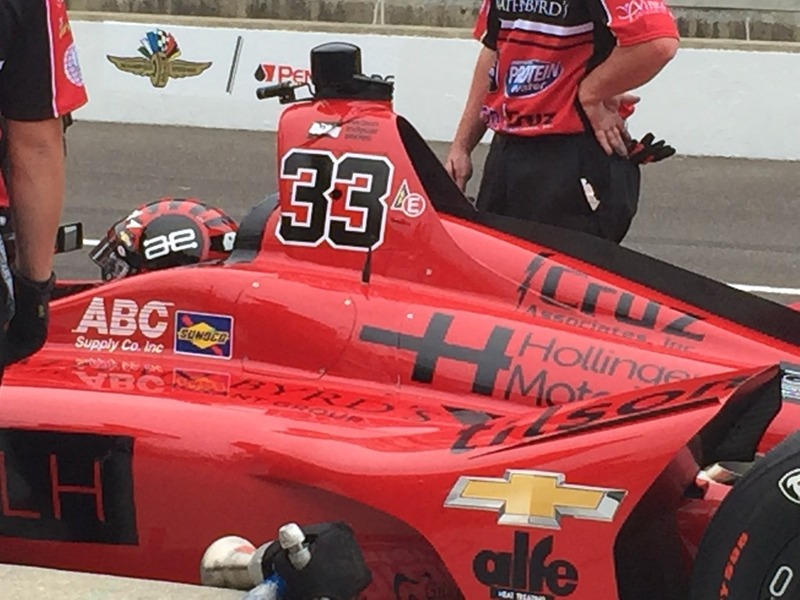 At the front of the field, Marco Andretti is now the fastest of the month with a speed of 231.802 mph. Robert Wickens is second at 231.732 followed by Ed Carpenter, Oriol Servia and Will Power. There is an hour and forty-five minutes left. Over 1100 laps have been turned. As the day gets cooler after 5:00, speeds should pick up. Just as I type, there is a yellow-flag for a light rain. I’m hoping this is temporary and not the end of the day. Stay tuned. This entry was posted on May 18, 2018 at 3:21 pm and is filed under Indianapolis 500. You can follow any responses to this entry through the RSS 2.0 feed. You can leave a response, or trackback from your own site. Thanks for sharing George! I look forward to checking in over the weekend!!! Keeping up with it all week via youtube and my phone. Also appreciating all of your posts. Just have to say that I didn’t realize how much I missed Bob Jenkins. Class.